On a recent visit to Oxford I went to the city’s contemporary art gallery Modern Art Oxford (MAO). MAO and my local gallery, the Counihan Gallery in Brunswick are similar kinds of art galleries and yet very different and differences shows the impact of both local and national arts funding priorities on a small contemporary art gallery. Prior to my visit to Oxford I had seen a DVD from my local library about MAO. Both of galleries are on property owned by the local city councils and city councils have roughly the same population; the population of the city and non-metropolitan district of Oxford is 157,997 (2014) and the City of Moreland has a population of 147,241 (2011). MAO was established decades earlier in 1966, has a larger staff and is much better funded Arts Council England. It does not benefit from the international tourism in Oxford; the tourists are there to see old Oxford and not contemporary art. A major difference why MAO is far better gallery is that it is bigger. It has almost twice the size of galleries as the Counihan, plus other spaces over three floors. There is a bookshop, a basement performance space, a cafe (with kitchen) and a community access space for other exhibitions and events. It is in an old repurposed building that has been refitted for purpose. The new entrance way to MAO makes a clear statement about its existence and purpose, unlike the entrance to the Counihan which is inside the foyer of the Brunswick Town Hall, past the stairs and beside the window where you pay licenses and fines. This is typical of Moreland City Council and following long established practice of using some other building (‘temporarily’ for decades) as a gallery or a library. Both MAO and the Counihan show a program of free exhibitions. Due to its larger space Modern Art Oxford presents unique exhibitions from international contemporary artists, whereas the Counihan is more limited in its choice of artists. When I visited MAO there were two exhibitions on: Josh Kline Freedom and Kiki Kogelnik Fly Me To the Moon. Josh Kline’s Freedom was enjoyable on many levels. 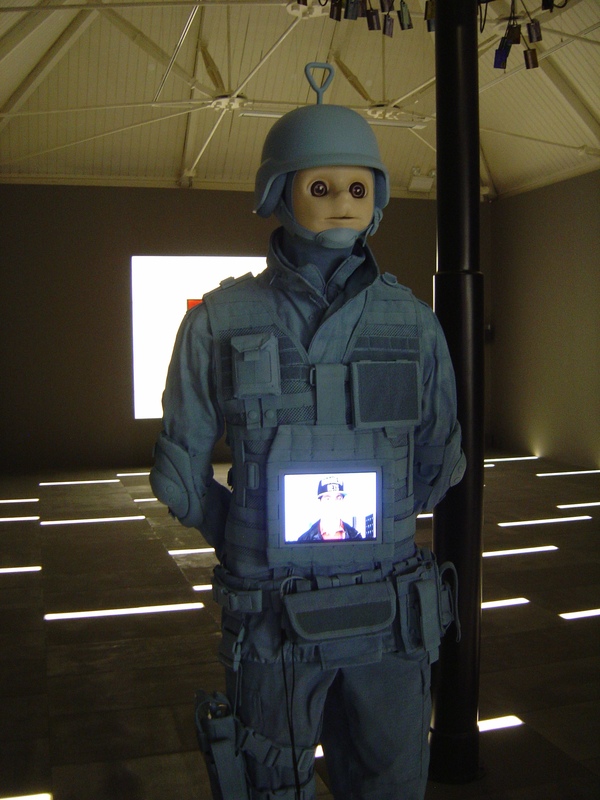 Healing post-9/11 America will require the fantastic vision of telly tubbies in full riot gear. 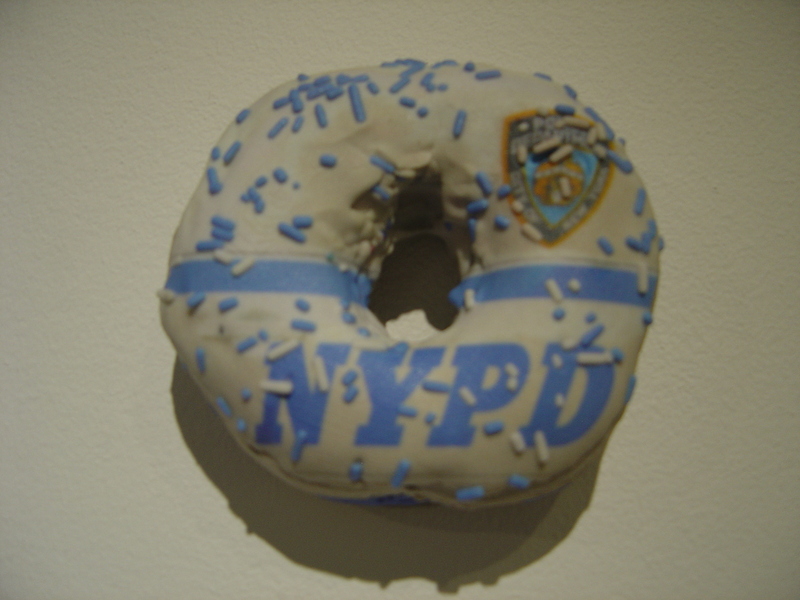 It will require cops to unhand-cuff themselves from their obscene donuts of stereotypes. I really felt deeply satisfied at seeing digitally altered George Bush and his co-conspirators saying sorry for all that they had done. (If John Howard had been amongst the digitally altered figures it would have been very difficult to believe him saying sorry for anything). Kiki Kogelnik’s art felt very dated especially in comparison to Kline’s exhibition. Kogelnik’s bright vinyl human figures hang limply on clothes racks. Kogelnik who was part of an early and desperate revival of figuration died in 1997; we no longer go to the moon.